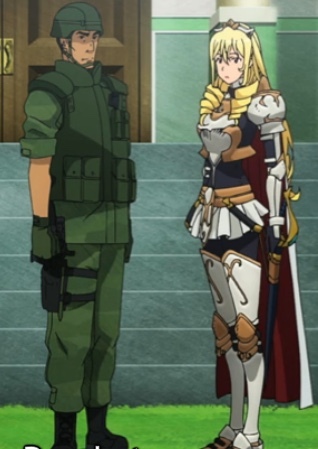 In Paradrop, the 23rd episode of Gate, the Japanese Self Defense Force (JSDF) begins the operation to free the Jade Palace and the peace-loving senators. Zorzal El Caesar manages not to learn a valuable lesson. Yōji Itami demonstrates his driving skills! Interested in merchandise? Check these out from Amazon! The political leadership having finally given the go-ahead, the JSDF launches their operation while Pina Co Lada languishes in her cell. The Kawasaki C-1 jets (Amazon sells a model here! ), packed with paratroopers, begin taking off. The JSDF methodically launch their attack. Ground troops take control of the capital’s West Gate, then the Bassoon Prison where the empire holds most of the prisoners. Next, the jets drop paratroopers over the capital. Zorzal didn’t quite know what to make of the paratroopers! Capture from the Crunchyroll stream. Nothing in their experience prepared Zorzal and his generals for the sight of hundreds of JSDF paratroopers landing in the capital. The crown prince is about to recover from his shock when a messenger arrives to say that the western gate is under the JSDF’s control. Unable to fathom they could move so quickly, he begins to panic. Had it not been for Tyuule, he and his generals might have bolted then and there. She plays on his vanity to tell him that of course he needs to stay, even if the JSDF penetrate the palace, because he’s the empire’s pillar. The JSDF continue their assault by pushing through the western gate and moving on the Jade Palace. At the same time, the they partnered with some old friends like Mizari (Misery) from the red light district to bring wagons in which to evacuate the prisoners. Mizari has to talk some of her compatriots into helping because they (naturally) distrust the nobility, even those whom the crown prince had imprisoned. While helping guide the prisoners to the wagons, Shino Kuribayashi meets the frightened wife of Senator Cicero La Moltose. The sergeant and Mari Kurokawa have to reassure here that the JSDF did not defeat the empire, and this operation is just to save them and protect the possibility of peace. Meanwhile, Itami’s driving the Toyota High Mobility Vehicle fast enough to draw complaints from Lelei La Lalena, Rory Mercury, Tuka Luna Marceau, and even Yao Ro Dushi. He tells them he can’t drive more slowly. He needs to get to the capital as quickly as possible. Remembering all of the men and women he’s worked with so far, he vows not to let a single one perish. At the Jade Palace, Bozes Co Palesti and her knights have been forced back to the palace’s front steps. Only a handful of them remain. The JSDF arrives and begins to change the flow of the battle. The imperial troops try to fight back, even firing one of their first volleys of arrows against the JSDF, but the end is never in question. Bozes kills Luflus, leader of the Oprichnina at the Jade Palace, as he tries to flee in terror. Bozes greets Colonel Shunya Kengun as me arranges to transport Sherry Tyueli, Reiko Shirayuri, Kōji Sugawara, and the others to Italica. She asks that he take her knights, especially those who are wounded, with him while she tries to rescue Princess Pina from the palace. He agrees. She makes one final request to wait for her at the rendezvous. Boozes and Beefeater leave to attempt a rescue of their beloved Princess. Zorzal’s generals report a complete collapse of all forces that came in contact with the JSDF, especially the troops and Oprichnina at the Jade Palace. Tyuule, her plans still incomplete, “suggests” that Zorzal not allow the JSDF to “get away” with the rescue. She says that he should send all of his troops to the Jade Palace. Boozes defends the first round of arrows, but the next struck her horse. Capture from the Crunchyroll stream. Boozes arrives at the palace, but despite her capable defense, the troops and Oprichnina overwhelm her and wound her horse. Beefeater rescues her and rides back to the rendezvous point, imperial troops following closely behind. By the time they arrive at the sole remaining helicopter, a large number of cavalry are right on their heels. The troops surrounding the helicopter open fire, but the sheer number of troops allow them to close in. Boozes, Beefeater, and the JSDF personnel barely make it onto their CH-47JA (Amazon sells a model of it here!) when the soldiers close in. The helicopter takes off. Boozes, though, is inconsolable. She asks Kengun to save Pina, but of course, there’s nothing he can do even with their technology. Despite their mission’s success, the troops are crestfallen. Zorzal receives yet more bad news: the JSDF rescued the prisoners from Bassoon Prison and killed more troops than had been clear before. Tyuule ratchets up the pressure, saying the JSDF will be back because Zorzal still has Pina. That will be his chance to show the people he can defeat the JSDF. It’s raining and dark as Itami and his team arrive at the capital. The JSDF planned their attack with extreme precision, taking out the empire’s arial defenses first, then establishing a beachhead at the western gate. I really enjoyed not only seeing such a well-thought out plan, but such a plan executed so well, too. The little details during the attack seemed utterly realistic. I once worked with a man who had been in the United States military, and his descriptions of his duties as the solider in charge of paratrooper jumps matched what Gate showed. That included the last man out checking the cabin and thanking the aircraft’s crew. The shot of Zorzal trying to look strong in front of Tyuule made me laugh. There he was, trying to brag that this incursion was nothing, as paratroopers landed in the distance. He really had no concept of what they could do to him. 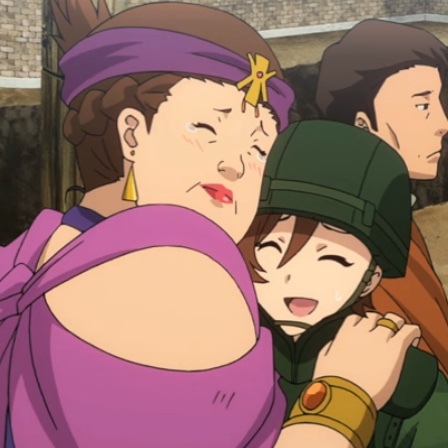 Cicero’s wife hugs Kuribayashi in gratitude for their rescue. Little emotional moments like this are why I like this series so much. Capture from the Crunchyroll stream. It must have been emotionally difficult for the imprisoned senators and their families. The political climate changed over night, and most likely weren’t sure they’d survive. Against that backdrop, I thought it was touching how Cicero’s wife threw herself into Kuribayashi’s arms and thanked her. Itami’s driving like a maniac, but for a reason: he doesn’t want to let anyone die. Itami so far shown the tendency to avoid danger, until he can’t. Then, he’s shown how effective he can be. After all, even the fire dragon fell. I’m really curious to see what he does next week to free Pina. At the Jade Palace, despite their overwhelming technological superiority, we get to see that even the JSDF are not immune to arrows. I was wondering when the imperial troops would try that attack, and I’m glad to see the episode treated it realistically. The shot of Colonel Kengun standing beside Boozes struck me as emblematic of why I like Gate. It could have been a show like the old United States westerns where the white folk simply massacre the technologically inferior Indians*. Gate took a different route. Kengun, leader of the fighting force that liberated Jade Palace, stood as an equal beside Boozes, who led the defense. In addition, I think stands in stark contrast to how the Zorzal and his ilk viewed and treated Pina’s knights. Their horse throws Boozes and Beefeater just as they arrive at the helicopter. Kengun catches Beefeater in midair and forgets to put her down until they’ve taken off. When he saw her before at the Jade Palace, he blushed, with was endearing to see on a hardened soldier. I strongly suspect he didn’t forget to put her down! I think he was trying to show off. Especially given how he had been holding her with one arm and firing before he boarded, and in the last shot, we see he’s holding her with both arms. Kengun treated Boozes as an equal; just as she treated him. Capture from the Crunchyroll stream. I was a little (okay, very little) disappointed when all of his team complained about Itami’s fast driving. I would have preferred Rory to just sit and smile knowingly, given their relationship. So, I admit, this really isn’t something I liked less, but I felt compelled to mention something kinda negative-ish. Oh, and we still don’t know what happened to Delilah and Akira Yanagida. So, there are two things! This was as satisfying an episode as I had hoped last week. The JSDF executed a measured, precise operation to extract the peace-loving prisoners and those trapped in the Jade Palace. 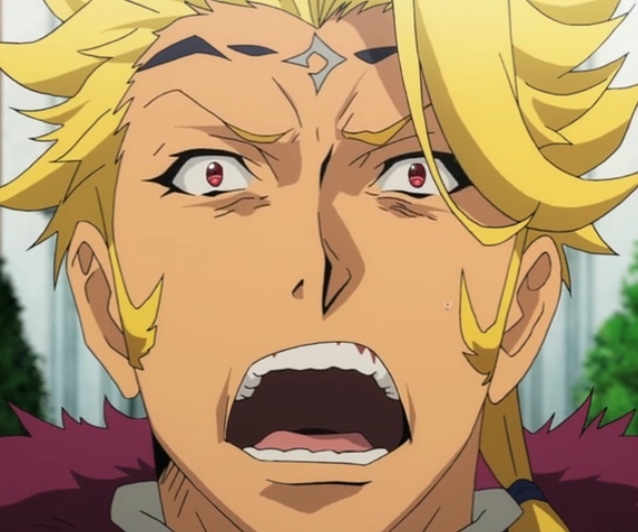 Seeing the expression on Zorzal’s face pretty much summed up the episode! Tyuule’s almost met her objective. I really wish she hadn’t been behind imprisoning Pina, because even though I understand where Tyuule’s coming from, she’s lost my support. Speaking of Pina, she seems close to breaking. She’s a decent soldier, and in that context, I’ve never found her courage lacking. 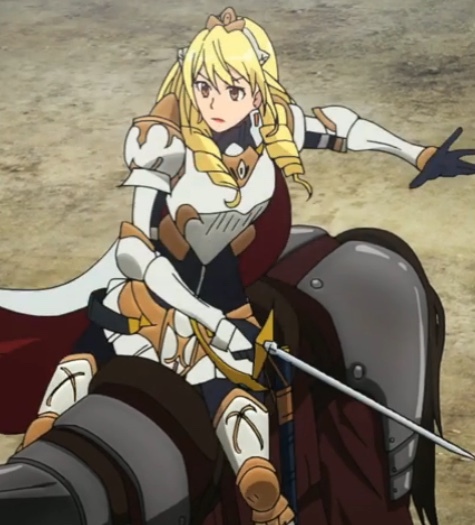 But as the user named Spacebird77 pointed out in the Crunchyroll comments for this episode, “They showed at the Battle of Italica that while she had ideals of Honor and Nobility, she had been a pampered Princess her whole life. She was clueless during the actual combat engagement. This [ her crying ] is not out of character.” I’d go one step further and say that enduring combat is one thing; enduring solitary confinement under inhumane conditions is something different. Far from making her an object of scorn, I think her distress is heart-breaking. I hope Itami can rescue her. Pina has almost reached the limits of her endurance. Capture from the Crunchyroll stream. Dimension W Episode 10: Oh, That’s What K.K.’s Operation Was For!